The gauge glass on a boiler, vat, reservoir or another vessel allows you to quickly get an accurate reading on the fill level or activity inside the tank, but only if you select the right gauge glass for your needs. Selecting the wrong type of glass or selecting low-quality glass that does not meet purity standards can result in damage to your equipment or your facility, and even injuries to your workers. When it comes to working with high-pressure liquids, liquids at high temperatures or materials that are corrosive, a heavy-wall gauge glass will give you the durability that you need. 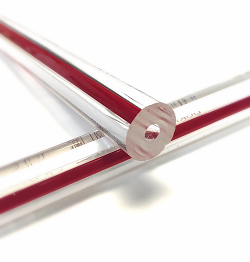 Redline heavy-wall tubular gauge glass is made from the most durable type of glass available – borosilicate glass – which offers an extremely high purity level and is made using a careful manufacturing process. This means that the tubular gauge glass to withstand high heat, high pressure and corrosive effects. The heavy wall tubular glass won’t warp, crack, melt or break under these conditions. Heavy-wall glass is even stronger than high-pressure tubular gauge glass and is used when liquids are at extremely dangerous temperature, pressure or acidity levels. With the redline featured on these heavy-wall gauge glasses, it is incredibly easy to see the flow of transparent fluids or check the fill level of clear liquids, especially water, leaving nothing to guesswork. The red line becomes more obvious in the presence of clear liquids, and less pronounced when the vessel is empty making it easy to make observations. Redline heavy-well gauge glass can be cut to any length, with a maximum length of 48 inches. Click below to order redline heavy wall gauge glass for your needs or call Gage Glass today at 800-780-3776 to learn more.